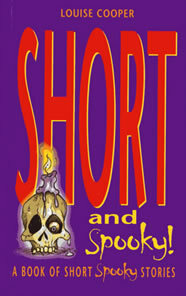 Just one of the many spine-chilling tales from SHORT AND SPOOKY! This house is starting to give us all the creeps. For ages there was no sign of trouble at all. But about a month ago, things started to happen. Mum was the first to see something. It was late at night, on the stairs—a little girl, she said, wearing a long white garment like a nightie. It really shook her up. The rest of us—Dad, me, and my brother and sister—didn't believe her to start with. We thought she was imagining things. But a couple of days later, my brother saw the girl, too, going up the stairs just the way Mum had said. And the next night, we all heard these weird noises—like music, but not any music we'd ever come across before. It was coming from downstairs. Dad wanted to investigate, but Mum wouldn't let him. If there was anything horrible down there, she said, then she didn't want to know! Trouble was, though, we couldn't ignore it, because from then on it got worse and worse. Every night something happened. Other figures started to appear, not just on the stairs but in the kitchen, the sitting room, even the bedrooms. I saw three of them for myself. A man and a woman, with that same little girl following along behind them. It really made my skin crawl. And nearly every night we heard the music. Mum still didn't want to know, but after a few weeks of it the rest of us had had enough. So last night, when the music started again, Dad and my brother went downstairs. My sister and I wanted to go with him, but we weren't allowed to. So we stayed with Mum, waiting. The wait seemed to go on for ever, but at last Dad and my brother came back. Their faces were grim. There was no doubt of it, they said. They'd seen what was down there. And now, we're going to have to do something about it. You see, people haven't lived in this house for years. We made sure of that. We scared off everyone who even thought about moving in. But people don't believe in ghouls, or bogeymen, or whatever you want to call us, any more. So for the first time in ages, suddenly there are humans here. We're not going to share our house with humans. No way. So tonight, we're going to get them. And then no one else will want to live here again.